In less than a week, summer's officially over, but temperatures—and our general warm-weather sentiment—have begun cooling since Labor Day weekend. While it's sad to retire your oversize sunglasses and fold away your summer whites, there's plenty to look forward to—namely all the new cold-weather pieces you'll soon be layering. The hero piece of any fashion girl's fall wardrobe is a sweater. The cozy staple is the foundation of every other fall outfit, topping off jeans, skirts, and slacks for an endless lineup of ensembles that are simultaneously chic and comfortable. 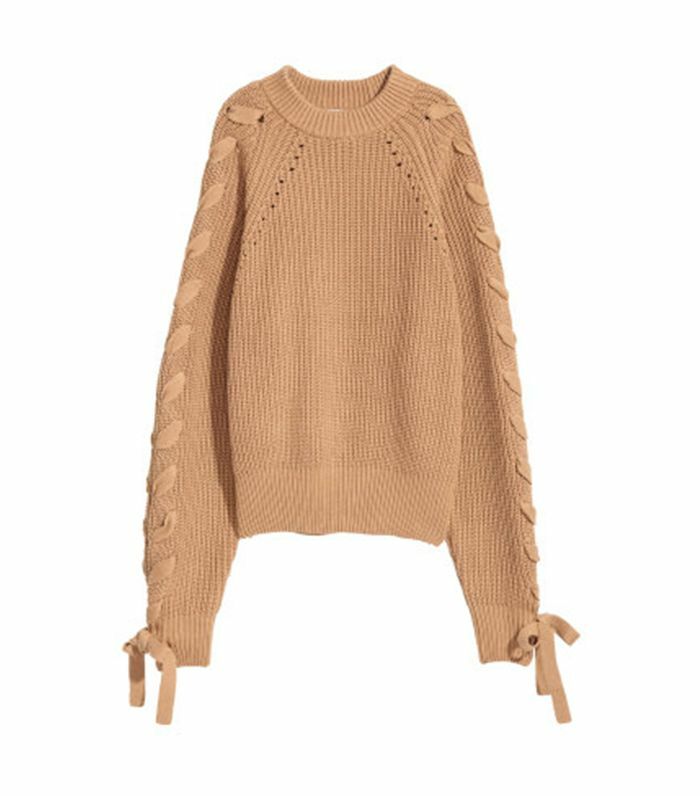 As a consolation prize for the final week of summer, we've rounded up the coziest fall sweaters to shop today and wear through winter. Head below to shop our edit of the coziest fall sweaters to add to your wardrobe this season. Then bundle up in cashmere, mohair, and merino wool fabrications boasting fringe, lacing, or cropped sleeves. Lacing details transform an oversize sweater into a statement piece. Opt for fringe and asymmetrical cable detailing for boho vibes. A classic ribbed sweater with a V-neck is the perfect pairing with jeans or a skirt. Opt for short sleeves for warmer days when sweater weather isn't entirely in full swing. A boat-neck silhouette is a super-flattering take on the cozy fall sweater. Make a statement with printed words while warming up in Merino wool. Nautical is in no matter the season. Nothing beats a classic crew-neck in a neutral colorway. Bundle up in a thick turtleneck once temperatures drop. A gray cashmere sweater is a fail-safe piece to add to your fall wardrobe. Unexpected details like bows and billowing sleeves make an otherwise traditional sweater fashion-forward. A statement sleeve is a guaranteed way to take your cozy fall sweater to the next level. Next up, see how L.A. girls do sweater weather.